I hadn’t ever made a fairy garden before, in fact it wasn’t even on my radar until I became a frequent visitor and friend at Gardening Nirvana. 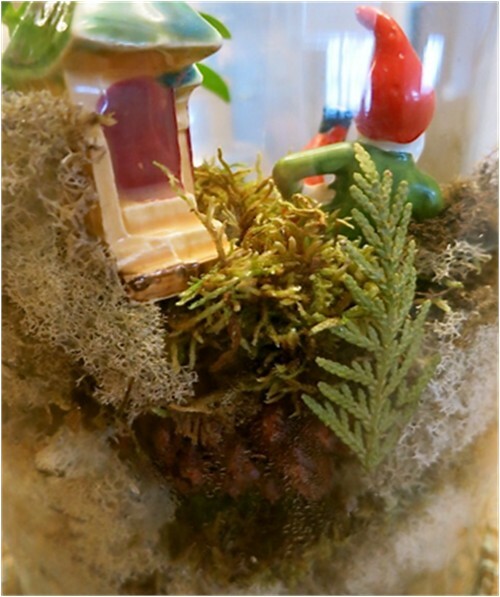 Alys revamp’s her very own Fairy Garden for every special occasion and is brilliant at recycling everyday objects into her charming creations. With that in mind, I used my faded Christmas wreath as the filler inside the glass urn. 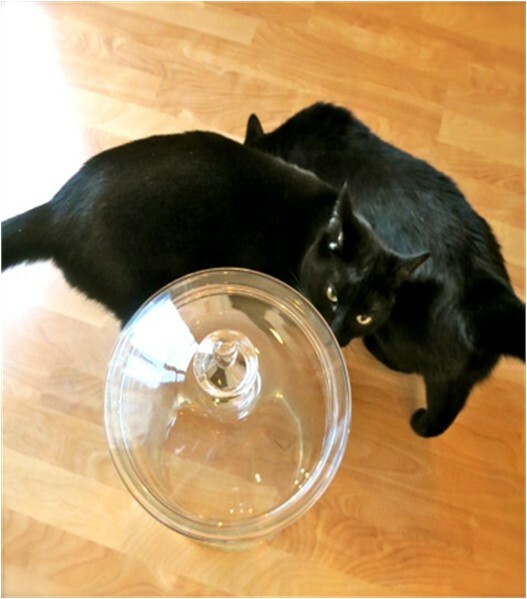 I had to have something with a lid, as the kitties are relentless about plants in the house. They absolutely must investigate anything new. Here’s the sharks kitties circling the container before planting. Since I was re-cycling the pine and cones from my old wreath and additional cedars from the Winter Pots, I decided my garden would reflect a boreal forest. I splurged ($10) on a miniature tree grown especially for a miniature garden. 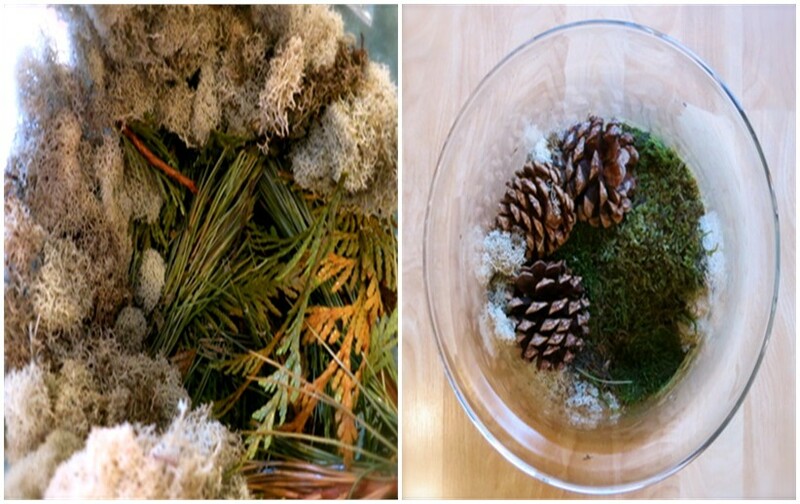 I started by making a nest inside the urn with layers of recycled cedar bits and Reindeer Moss (Michael’s $5.00). I added a little garden soil inside the nest to lay my sheet moss on. This will give the moss something healthy to grow on. If you buy dry sheet moss (Michael’s $5.00), do let it drink water in a shallow dish for a couple of days before. I wanted a little hill so I added the pine cones I salvaged from my Christmas wreath, put a little dirt on top and covered them with another piece of sheet moss. The fun part is adding your treasures. If you are a frequent visitor at Boomdeeadda, you know I love all things vintage. Naturally the Fairy Garden had to reflect that. Romeo, the squirrel, Gnome and his garden house are inexpensive vintage finds from the Antique Mall. The glass stepping-stones are from Corinthia Flowers, but you can find these at most Dollar stores. If we’re very quiet, we can catch a close up view of the garden layers in the urn from behind. Can you see the pinecones tucked in there? I’ve hardly had to water it at all since the moss was very moist when I made the garden. A quick spritz with a spray bottle does the trick. the lovely Marlene at In Search Of It All told me all about Tomte-gnomas….maybe Tommy? I just can’t help saying hello every time I walk by, I’m having so much fun. I hope you’ve gotten some ideas for a Gnome home of your own. I just read ph gardener’s blog and realized that is how I knew you already. I swear I saw a card somewhere, too . Time to browse your lovely blog! Hello! Thanks for visiting, that’s so nice of you. Isn’t PJ a doll? I just love her and her blog and well honestly the kitties are crazy cute too. it’s lovely. My sister used to make those with my little niece. Oh, this is so pretty! I like the little miniature bottle tucked in…it seems almost magical. I’ve no name suggestions…Well, he actually looks like a Fergus or Seamus to me. Regardless, this is so lovely. And yes, the kitties do circle like sharks at times, don’t they? It’s very unnerving. You say the nicest things, thanks Jen. He’s really good company in the kitchen too. Those sharks, errrrrr kitties really get their nose in everything. HA But they get me through the day with lots of smiles too 😀 Thank you fro visiting. Good work 🙂 Looks cool! I love the idea of creating a berm or hill with the pinecones. Clever you! This turned out so well. Thanks for taking us through the process. Good luck naming the gnome. Now say that three times, fast: gnome naming, gnome naming, gnome naming. Thank you my dear. Wouldn’t it be fun to have a couple of hills? Red could have a neighbour, HA. I’m going to need a bigger urn (think ‘Jaws’). Giggle…gnome name, gnome name..LOL. One would think cats might be reluctant blog stars. Not these two. They are on my heals all day. Especially Blossum, she gets her little toes stepped on all the time because she’s like a little shadow. I’m having a ball…mwaaaa. Hurray for having a ball! Mwaaa to you too. Your kitties are excellent models. I love it when they appear. You do a clever job capturing the moments, too. LOL LOL! Mr B is too engrossed in ‘The Amazing Race’ right now…la la la, keep em’ guessing HA. I love fairy gardens… haven’t seen one in quite some time. Thanks for sharing yours. I think they’re are making a teeny-tiny comeback in a huge way. I’ve got some really neat ideas from Pinterest too. Darn that Pinterest, it’s such a wealth of projects, LOL. Thanks for visiting Kerri! 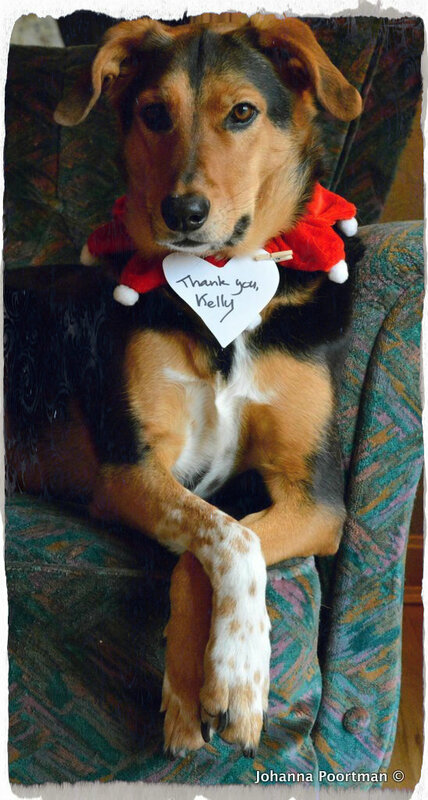 LOL, Shelley you are priceless. I should hope you’d find the ‘eat me’ cake so you could pop back too. It might well be 1865 in this little fairy tale jar since my very own friend Alys has been my inspiration along the way. I’ve been hunting for a name too, maybe Alastair. It sounds like an old soul. Astaire? A little sparkle of a name. Mmmmmmm. This is tricky. How fun, indeed! and I loved reading all of the comments! You’re right, the comments are very often like a second post. I skip back a lot to past posts to enjoy them again and again. Agreed, I have the nicest visitors. Thanks for being here LB. Since I saw the word cobble above I thought of the Brothers Grimm story the Cobbler and the Elves which is also known as Gnomes or the Cobbler and the Gnomes. Of course my mind is wandering other places as well. My suggestions for names are Rumplestiltkin, Grimm or Cobble. The miniature garden is great. You are so resourceful and creative! I like lots of the suggested names–but I think that Herbie is my favorite. Thanks so much Sheryl, Herbie’s a cute one for sure. I was lucky to have the greens handy and surprisingly, some that remained frozen underneath were still fresh and green. Thank you Sheryl, I didn’t want to look at the dirt so it was a perfect solution. I think you could also etch the glass in the bottom of an urn or clear jar, that would look pretty too. They sell glass etcher at the craft store. The idea is really from Alys at Gardening Nirvana. If you want to see more Fairy Garden Magic I included her link 😀 She’s a great gal! You’ll love her, I do. Yours is absolutely lovely and I don’t blame you for putting a lid on it! Thank you for your encouragement too, this is a magical place to be with all you all here. Hugs 2U. 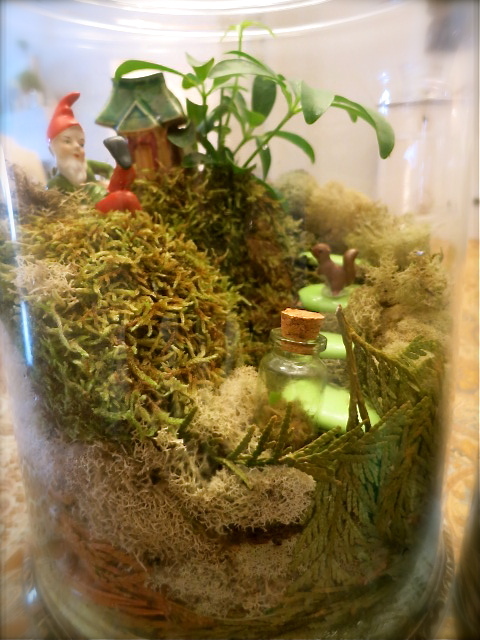 I fell in love with the fairy gardens after seeing lots of them on Pinterest. Not sure if I will make one, but if I do, you bet I will do a blog post on it! The doll furniture would work well for the fairy gardens – – fairies need to sleep too, right? How about even a little car? That’s a fantastic garden. My hubby would absolutely love it! Weird, I know but he loves fairies and dragons and wizards and, well – all such things. Oh thanks for your nice message. He could try one for certain. Really pretty easy to do. The tricky part for me was finding an Urn large enough with a lid. Then I spotted this one on the discount shelf in a local Home store. Enjoy the day! Do you ever look to see if your gnome has moved anything around? LOL, that would freak me out I think. Mr B reads this! Let’s not give him any wild ideas HA thank’s for that, made me laugh. Ha ha, now that would be funny if things were moved around! It is kinda like the Elf on the Shelf, but it would be the Gnome on the Shelf instead. Your gnome could do funny things all around your house and you can take picture of what he gets into! That’s such an Awesome idea Val….hehehe. I see an adventure in his future for sure. xK You’re so darn cute. LOL, I try! It is a good idea! Start placing him all over the house doing bad things (unrolling the TP, in the litter box, writing on mirrors with your lipstick) all funny blog posts! Adventure awaits! HA! litter box…..diabolical! You definitely need a Gnome in your home, you would have a blast! I am on a roll today for sure! If your gnome went potty in the litter box, get a picture, and when he is crawling out of it, make sure you have a little piece of toilet paper stuck to his foot as he is walking away! LOL, now that would be hilarious!